ICEA is a youth-led not-for-profit organisation that aims to achieve reconciliation through mutual respect for all Australians. 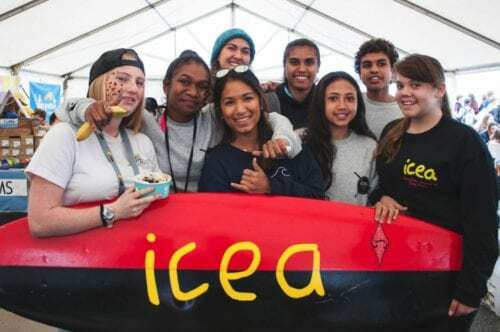 ICEA runs programs and events for young people that aim to facilitate positive, genuine cross-cultural experiences, build enduring relationships and ultimately foster greater understanding of Indigenous cultures and Australia’s shared history. We work with young people in the Perth Metropolitan area and in remote communities on the Dampier Peninsula to empower young people to become the drivers of reconciliation into the future. The ICEA Marja Series aims to bring together young people from a diverse range of backgrounds to share positive relationships and build friendships. Centred on participating in music and sporting competitions and performances, Marja aims to empower young people to share and develop their skills as a way of connecting with others. We believe that through forming genuine friendships among and between young people and closing the social divide between Indigenous and Non-Indigenous Australians, we can make real steps toward reconciliation. Originating in 2008 as a fundraising program, ICEA has since formed a mutual capacity-building partnership with local Ranger groups and schools in three communities on the Dampier Peninsula: One Arm Point, Lombadina/Djarindjin and Beagle Bay. The Remote Communities program now focuses not only on encouraging and supporting school attendance and educational outcomes, but also on empowering young leaders to act as role models within community and on strengthening community and individual relationships. Comprising 5 trips to the Peninsula throughout the year, the program provides incentives awards for students achieving over 85% attendance, opportunities for learning on Country for students achieving 100% attendance, and a recreational and skills-based Holiday Program for all students over the mid-year break. Delivered primarily by volunteers, this program is truly a grass-roots initiative achieving real change in the reconciliation space, not only by empowering community, but also by linking young people in Perth to the communities in an eye-opening way.